Newswise — CHAPEL HILL, NC – When cells grow and divide to ensure a biological function – such as a properly working organ – DNA must be unwound from its typical tightly packed form and copied into RNA to create proteins. When this process goes awry – if too little or too much RNA is produced – then the result could be diseases such as cancers. UNC School of Medicine researchers have discovered that a protein called Spt6, previously known to have a key role in making RNA and repackaging DNA after RNA copying, also facilitates RNA degradation so that cells have just the right amount of RNA for the creation of proteins. “By revealing and understanding this mechanism, we can start to think about targeting parts of it therapeutically in diseases in which Spt6 isn’t working properly,” said study senior author Brian D. Strahl, PhD, the Oliver Smithies Investigator, Professor, and Vice Chair in the Department of Biochemistry & Biophysics at UNC-Chapel Hill. Every human cell carries a large amount of DNA – called the genome – composed of roughly 3.5 billion letters that assemble into the genetic code. Researchers have been studying how large genomes fit into the tiny confines of cells. We know that proteins called histones carefully organize and package DNA in cells. Much like wrapping yarn around its spool, the DNA wraps around the histones to be condensed into a smaller space. Although histones help to keep DNA packaged, this packaging creates a barrier to “reading” the genetic information housed within DNA. The DNA needs to be “opened” much like a book needs to be opened for the pages to be read – except that “opening DNA” is a little complicated. Accessing DNA information is a highly controlled process that involves temporarily removing the histones so the genetic code can be copied into RNA and the RNA can then be used to create proteins. Normally, cells destroy the copied RNA “messages” once they are no longer needed. Diseases such as cancer may arise when the ability of cells to either produce or destroy the messages goes awry. When a gene is copied into a strand of RNA, the DNA in and around the gene must be loosened from its normal tightly wound configuration. Scientists have known that Spt6 has the crucial job of helping DNA become tightly re-wound when the copying process is completed. But that’s not its only function. The first thing Strahl’s lab investigated was how Spt6 binds to RNA Polymerase II, which is the enzyme machine that copies DNA into RNA. The function of this Spt6-Polymerase II interaction has been unclear. So the Strahl lab wanted to determine whether a non-binding version of Spt6 still performed its DNA-histone rewrapping function. “It dawned on us that there is more to Spt6 function than just re-wrapping the DNA around histones and facilitating RNA Polymerase copying of DNA,” said first author Raghuvar Dronamraju, PhD, research assistant professor in Strahl’s lab. 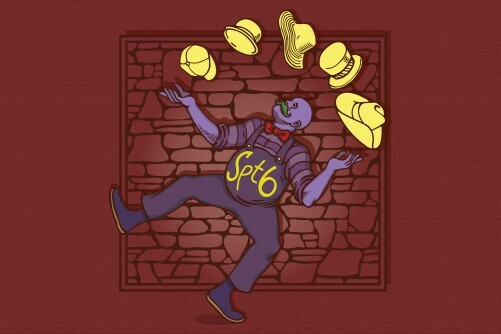 It wasn’t clear at first how the disruption of Spt6’s binding to the polymerase caused RNA misregulation, but further experiments revealed a completely unexpected mechanism. Strahl’s team went further and connected the dots to show that Spt6 interacted with one of the cell’s major RNA degradation machineries – a protein complex called Ccr4-Not. Strahl’s team showed that Spt6 used its interaction with RNA Polymerase II to recruit Ccr4-Not during gene expression to ensure the proper balance of enzymes that protect and degrade RNA. “Given Spt6 in humans is sometimes found mutated or misregulated in cancers, it will be important to examine this RNA control mechanism further to determine whether its failure contributes to cancer,” Strahl said. His team will turn to researching this with the hope that future studies could identify new therapeutic targets to treat human disease. The researchers still have many questions about Spt6’s involvement in regulating RNAs. But already it’s apparent that Spt6’s influence on RNA stability represents “a new twist in transcription,” as Strahl calls it. This research was performed with baker’s yeast, a classic basic science organism that researchers use to investigate the intricate details of how cells perform and control many biological functions. Importantly, the yeast studies can be extended to human cells because the same proteins occur in yeast and humans. Other co-authors are Austin Hepperla, Yoichiro Shibata, PhD, Alexander Adams, Terry Magnuson, PhD, and Ian Davis, PhD. The National Institutes of Health and the Corn-Hammond Fund for Pediatric Oncology funded this research.